The partnership calls for the U.S. aircraft manufacturer to hold eighty percent of the new joint venture while the Brazilian manufacturer will hold the remaining twenty percent of the stake. RIO DE JANEIRO, BRAZIL – A Brazilian judge in São Paulo has suspended temporarily the merger between Brazilian aircraft manufacturer Embraer and its U.S. counterpart, Boeing. According to Judge Victorio Giuzio Neto, however, the suspension does not prohibit negotiations to advance, only a decision to be taken at this time. 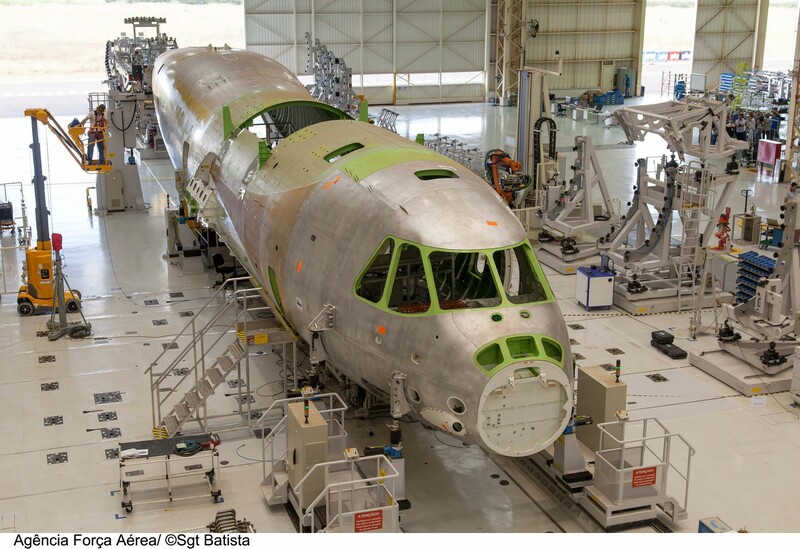 Plane being manufactured at Embraer plant, photo by Sgt. Batista/Brazilian Air Force News Agency. “Considering the proximity of the recess of the Judiciary and the taking office of the new President of the Republic, along with the extensive renewal of the Legislative Branch …it (is) advisable to avoid any concrete actions to take place during this period creating a difficult or impossible a reversal situation of the ‘segregation’ of Embraer and its transfer to Boeing,” stated Giuzio Neto in his decision. The injunction of the merger was the result of a popular action filed by federal representatives Paulo Pimenta and Carlos Zaratini, both from the PT (Workers’ Party). “Defending the national heritage is not putting on a green and yellow shirt, but it is in fact going to the fight so that our patrimony is delivered without a fight to the United States and other countries,” stated Zarattini justifying the request for suspension of the merger. Embraer issued a statement to the market stating that the deal that Judge Giuzio Neto partially approved the injunction, ‘without any obstacle to the continuity of negotiations between the two companies’. In July of 2018 Embraer and Boeing signed a memorandum of understanding to establish a strategic partnership between the companies to accelerate growth in global aerospace markets.